We have received your bond guide request. 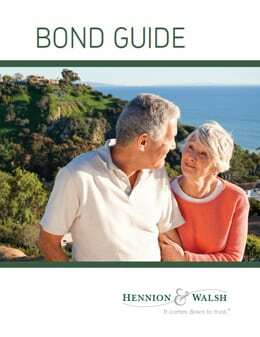 You now have access to free information about bond guides. © 2019 Hennion and Walsh. Securities offered through Hennion & Walsh Inc. Member of FINRA, SIPC. Investing in bonds involves risk including possible loss of principal. Income may be subject to state, local or federal alternative minimum tax. When interest rates rise, bond prices fall, and when interest rates fall, prices rise. *Source: Moody's Investor Service, March 7, 2012 "U.S. Municipal Bond Defaults and Recoveries, 1970-2011." Past performance is no guarantee of future results. © Hennion & Walsh 2019. All Rights Reserved. Securities offered through Hennion & Walsh Inc. Member of FINRA, SIPC.